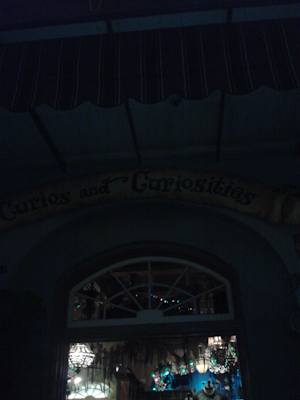 Back over to New Orleans Square, we have the Port Royal shop. Look, Ma! It's a mediocre cell phone pic! 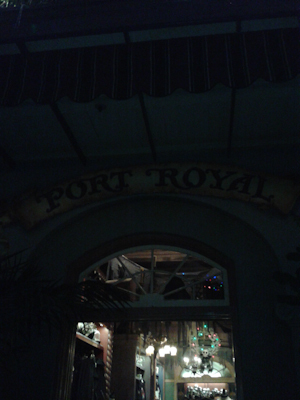 The Port Royal is located in between the place where you get gumbo and clam chowder, and the exit of the Pirates of the Caribbean. Almost as good of a picture as the last one! 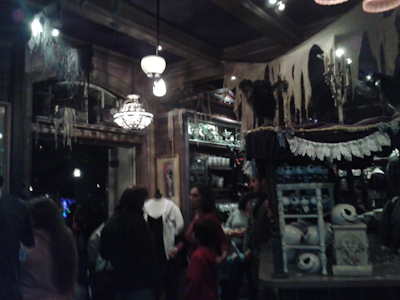 The Port Royal is primarily devoted to dead people, specifically the Nightmare Before Christmas and Haunted Mansion merchandise. I believe at one time (and I know someone will correct me if/when I’m wrong), that this merch used to be at Le Bat en Rouge, but Port Royal is a larger store, and dead people are apparently a big seller. Apropos of very little, when I went to the Mouse Next Door with my friend Lyn a few months ago, we hit up the Animation Academy and learned how to draw Jack Skellington. I’m telling you, my artwork rivals that of any preschooler. It actually makes me feel better that I’m only slightly more talented than my just-turned-3-year-old. In another six months he will likely exceed my skill, and I’ll go back to having depressingly low self-esteem. But continuing on that tangent, because I know you care, I actually took and Intro to Design class at our local community college to get over my fear of my own art. For some reason, my instructor was extremely into fish, so basically all of our projects were fish-related. I did get an A, but it did not solve my fear of art, and perhaps even exacerbated my fear of artistic fish. 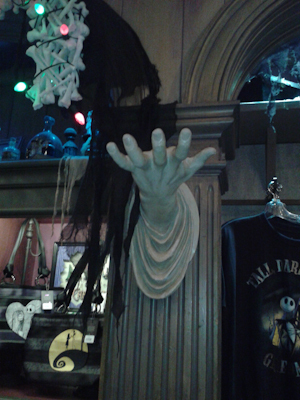 Anyway, like all of the other shops in Disneyland, but particularly in New Orleans Square, the decorations are even better than the merchandise. I kind of want this, if I owned a house that had these things on the wall. Incidentally, did you know that Thing has his own Wikipedia entry? Sometimes I worry about the internet. 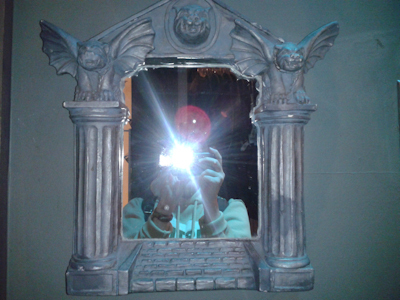 Is there anything cooler than people taking flash photography of themselves in a mirror? 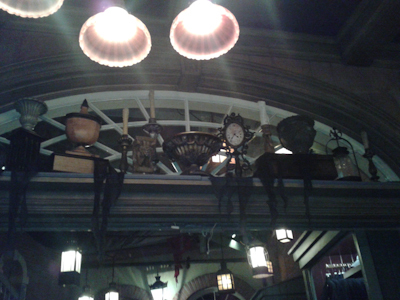 And of course, things above doorways. 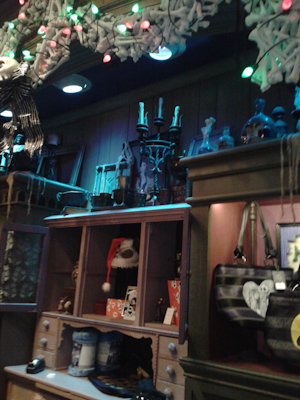 Even if you’re not a huge Nightmare Before Christmas fan, or a Haunted Mansion/Dead People fan, the Port Royal store is pretty darned cool. On our visit to Animation Academy, my then-5-year-old daughter was not at all happy with her drawing of Tigger. She became quite frustrated until she had a bright idea. She had written her name across the top of the page (as kindergarten teaches them to do so well), then she crossed off her name and wrote “Momy”. She tried to blame that mess of a Tigger on me! Mine was not going into any gallery, but at least I would have spelled my name correctly.